Thinning hair is not just a problem that strikes men. We tend to think of men first, but according to the American Hair Loss Association, 40 percent of those who suffer from hair loss are women. Because it’s not traditional to focus on hair loss for women, it can also be particularly difficult to deal with given society’s attitudes towards women and hair. At RHRLI, we treat all types of patients and we know how hard it is for women who are losing their hair. That’s why we offer a permanent solution to hair loss and thinning hair. Our state-of-the-art treatment is called the ARTAS® system. It uses robotic technology to give our patients a fuller, healthier head of hair. Because so many patients are women, we want to focus on some of the issues related to women losing their hair and tell you about some of the major causes of hair loss for women. The most common form of hair loss is often called male pattern hair loss but is also called female pattern hair loss. It’s believed to be triggered by Dihydrotestosterone (DHT). According to AHA, women have trace amounts of the male hormone testosterone, which converts to DHT. The DHT binds to receptors in the scalp follicle and the hair follicles begin to shrink, which makes it impossible for healthy hair to survive. 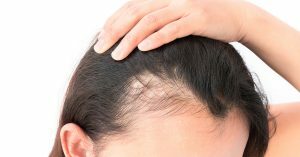 The majority of women who suffer from Androgenetic Alopecia, or female pattern hair loss have thinning on all areas of the scalp while men have more distinct patterns. Two other common types of hair loss that affect women carry the name effluvium. According to WebMD, the word means outflow. It refers to the cycle of hair growth. There’s a growth phase, an intermediate stage and a resting or shedding phase. Telogen Effluvium is a common form of hair loss for women that occurs when the shedding phase comes prematurely or if they don’t leave the resting phase quickly. The amount of shedding hair increases. It’s believed that this can be caused by sudden environmental shocks according to WebMD. Another effluvium, called Anagen Effluvium, also occurs after a shock to your system. It’s commonly associated with chemotherapy which is a medicine or group of medicines used to fight cancer. According to Health.com, there are several other conditions which can be a catalyst of hair loss for women. They include pregnancy, physical or emotional stress, dietary issues such as lack of protein, and hypothyroidism (which is an underactive thyroid gland or autoimmune diseases). Autoimmune conditions and thyroid disease can cause permanent hair loss. Another cause of hair loss that women should look out for is traction alopecia. This is caused by trauma to the hair follicles which occurs when one wears a tight hairstyle that pulls at your hair over time. Tight buns or ponytails can cause this. Several conditions, such as effluviums, involve hair loss that’s only temporary, while certain medical conditions can be permanent. Others can be long term. If you have a hair loss condition and feel you need a permanent solution, RHRLI can help. To get started, contact us today.